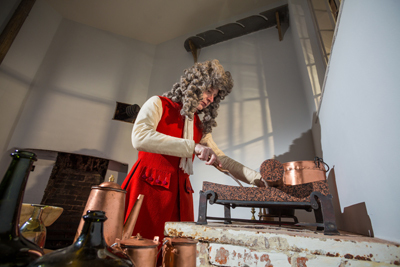 Once making chocolate for kings including William III, George I and George II, a special royal chocolate-making kitchen has opened at Hampton Court Palace – the only surviving example of its kind in the country. The opening – which is part of Historic Royal Palaces’ celebration of the 300th anniversary of the Hanoverian accession – comes after research identified the exact location of the kitchen which, having been used as a storeroom, was found in a “remarkably well preserved” state with original fittings such as the stove and furniture intact. Among those known to have worked in the kitchen is Thomas Tosier (pictured above), personal chocolatier to King George I, and it was in here he prepared special chocolate drinks. (Interestingly, Tosier’s wife Grace apparently traded on her husband’s royal association to promote her own chocolate house in Greenwich). A new display in the kitchen explores how the chocolate was made for the king and features copper cooking equipment and bespoke chocolate serving silverware, glassware and linens from the 18th century. The Royal Chocolate Kitchen will also play host to live Georgian chocolate making sessions. PICTURE: © Historic Royal Palaces/Richard Lea Hair. WHERE: Hampton Court Palace, East Molesey, Surrey (nearest station is Hampton Court from Waterloo); WHEN: 10am to 4.30pm until 29th March after which it’s open to 6pm); COST: Adult £18.20, Concession £15.40, Child under 16 £9.10 (under fives free), family tickets, garden only tickets and online booking discounts available; WEBSITE:www.hrp.org.uk/HamptonCourtPalace/.